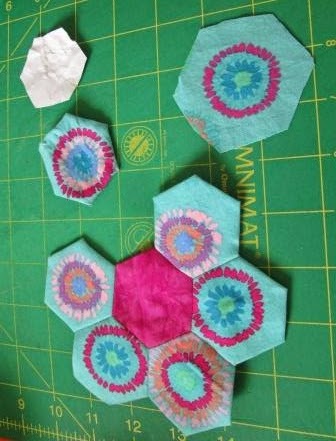 I have been working all summer on my Hexagons made with Kaffe Fassett Collection fabric and Pink Bubble Gum Kona Cotton. Here is a part of the lay out I am thinking of doing. I am planning to use more green KFC for between the flowers. I am not really liking the green, maybe to busy looking. Opps, I had a little repair job to do. Gemma Pup got a hold of this flower and put a whole in one petal. I had to fussy cut a now hexagon and resew. I have added this post to Kathy's Quilts, were you can find more hand work. 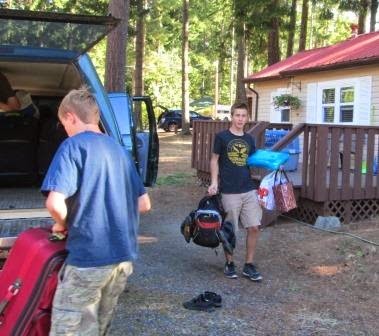 Here is my boys loading the truck, the cabin is were we stayed for 3 nights. Take special note of the blue box my oldest is carrying, it is my Hexagon project on the move. So nice to see then working hard. I got a far bit done on the hand stitching. I tried basing hexagons on the drive. I get car sick easily but I was able to baste Hexagons on the straighter roads. Miracles do exist. 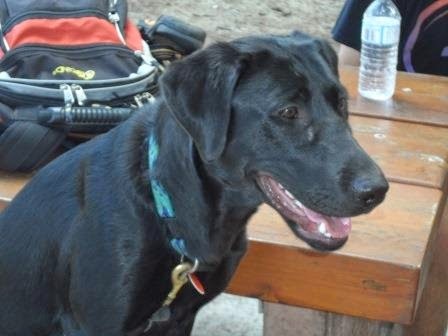 Gemma Pup on one of our hikes. We had both dogs with us, so it was kind of a different vacation. 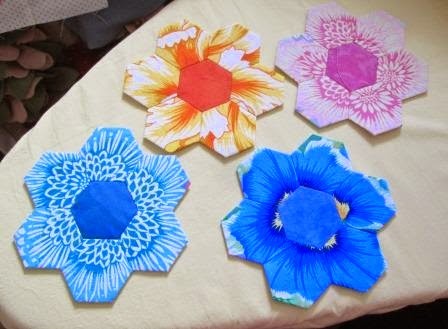 I love these very artful choices for your hexagons. The hexi colors are amazing! Vacation time is always nice when you can throw in some sewing. 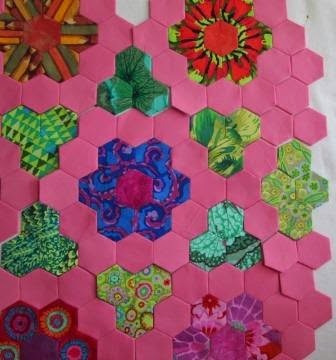 Love the bubble gum pink solid as the background for your KFC hexagons. It always amazes me at the different combinations that can be done. Have fun as put in some basting stitches today! I am so impressed you can stitch at all in the car. There is no way for me to. Visiting from Slow Sunday Stitching. sounds like it was a wonderful vacation! I love those beautiful hexagons.